Directions (1 - 5): Study the following information carefully and answer the given questions. The following table gives the percentage distribution of number of boys and girls likes a maths or physics or neither in three schools A, B and C.
1. Find the total number of girls like only one subject in all the three schools? 2. In which of the following school, the difference between the number of boys and the number of girls like at least one subject, is maximum? In school C has the difference between the number of boys like at least one subject and the number of girls like at least one subject is maximum. Quantity I: Total number of boys like only one subject in school C is what percentage more than the total number of girls like only Physics in school A? Quantity II: The number of boys like both Physics and Maths in school A, the number of girls like both Physics and Maths in school B and the number of boys like both physics and maths in school C is what percent more/less than the number of girls like only Physics in School B? Quantity III: The number of girls like both Physics and Maths in school C is what percentage of the number of boys like only Maths in the same school? 4. What is the difference between the total number of boys like only one subject and the total number of girls like neither Physics nor Maths? 5. Find the ratio between the total number of students like neither Physics nor Maths and that of the total number of students like both Physics and Maths? Find the total number of defective cars manufactured by company B and C in the year 2012 and 2014 respectively? Statement I: Number of defective cars manufactured in the year 2012 by company B is 50 more than company C and 150 less than company A. The number of defective cars manufactured by company D in 2012 is 18% of the total cars manufactured by company C in the same year. Statement II: Number of defective cars manufactured by company C in the year 2014 is twice the number of defective cars manufactured by company B in the same year which is 300 less than the number of cars defective cars manufactured by company D in the same year. From statement I, we can find the number of defective cars manufactured by company B in the year 2012 and there is no information about the number of defective cars manufactured by company C in the year 2014. Number of defective cars manufactured by company C in the year 2014 is twice the number of defective cars manufactured by company B in the same year which is 300 less than the number of defective cars manufactured company D in the same year. From statement II, we could not find the number of defective cars manufactured by company C in the year 2014. From I and II, both the statements are not necessary to answer the question. Which of the following statement is true according to the given information? I) The difference between the number of cars sold by company B in the year 2011 and the number of cars sold by company D in the year 2013 is 2250. II) The ratio of the total cars sold by company C in the year 2014 and 2015 together to the total cars sold by company A in the year 2013 and 2014 together is 81: 76. III) The total number of cars manufactured by company A and B in the year 2011 is equal to the total number of cars manufactured by the same company in the year 2014. Total number of cars manufactured by company A and B in the year 2011 is not equal to the Total number of cars manufactured by the same company in the year 2014. 8. In which of the following year, the number of defective cars manufactured is minimum in the given years? In the year 2011, the number of defective cars manufactured is minimum. Quantity I: Find the total number of cars sold by company C in the given years. Quantity II: Find the total number of cars sold by company D in the given years. 10. In which of the following company has maximum increased percentage in the year 2014 from the previous year (comparing the total number of manufacturing cars)? Company B has maximum increased percentage. The following table gives the percentage distribution of number of boys and girls likes a maths or physics or neither in three schools A, B and C.
The number of boys in school A is 200 which is 11.11% more than the number of girls in the same school. The ratio of the number of boys to girls in school B is 5: 4. If 50 more girls joined in the class then the ratio of boys to girls becomes equal. The number of girls in school C is one-fourth of the total number of boys in the school A and the number of girls in the school B together and the ratio of the number of boys to girls are in the ratio 3: 2. Note: Students like Only Maths, Only Physics, both Physics and Maths and neither Maths nor Physics. 1) Find the total number of girls like only one subject in all the three schools? 2) In which of the following school, the difference between the number of boys and the number of girls like at least one subject, is maximum? 3) Quantity I: Total number of boys like only one subject in school C is what percentage more than the total number of girls like only Physics in school A? 4) What is the difference between the total number of boys like only one subject and the total number of girls like neither Physics nor Maths? 5) Find the ratio between the total number of students like neither Physics nor Maths and that of the total number of students like both Physics and Maths? Directions (6 -10): Study the following graph carefully and answer the given questions. The figure below shows the number of cars manufactured by four companies A, B, C and D in the year 2011 – 2015. The innermost circle represents 1000 cars; the next circle represents 2000 cars, and so on. 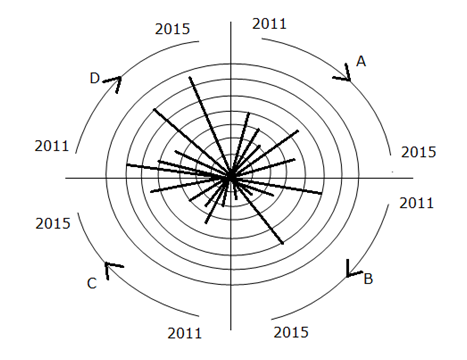 Each represents a particular manufacture and the five lines in each quadrant correspond to the years 2011 – 2015 in clockwise order. Note: If the line is between two circles it is consider as 500 cars. The table shows the percentage of cars sold in four companies A, B, C and D and the percentage of defective cars for all the given companies. 6) Find the total number of defective cars manufactured by company B and C in the year 2012 and 2014 respectively? 7) Which of the following statement is true according to the given information? 8) In which of the following year, the number of defective cars manufactured is minimum in the given years? 9) Quantity I: Find the total number of cars sold by company C in the given years. 10) In which of the following company has maximum increased percentage in the year 2014 from the previous year (comparing the total number of manufacturing cars)?